If you’re the welder everyone in your shop turns to for help, you perform carbon equivalent calculations in your head for fun, and you refer to sleeping as “non-arc time,” chances are you’ve entertained the idea of becoming a Certified Welding Inspector. If so, that’s marvelous, but it’s important to understand that the duties and responsibilities of a CWI are serious business. This is reflected in the 3-part certification exam administered by the American Welding Society, which covers a great deal of information and can be extremely challenging. So, how does one prepare for this behemoth of an exam? Well, the answer isn’t always so easy. The majority of CWI hopefuls opt to attend a week-long seminar with a live instructor at the helm. Going this route can certainly yield varying results, but a common sentiment among attendees is the belief that, in order to do well on the exam, you have to partake in the seminar. Now, I’m not interested in confirming or debunking that notion, but it’s clear that this mentality raises some concerns in regards to time and money. Not everyone can afford the price tag of a live CWI seminar, and not everyone can take a week off from work or completely put their life on hold in order to attend. As a result, it’s possible that qualified candidates may feel that the deck is stacked against them, and may be discouraged from even taking the exam. For those of you nodding your heads, I have some news you may find interesting. 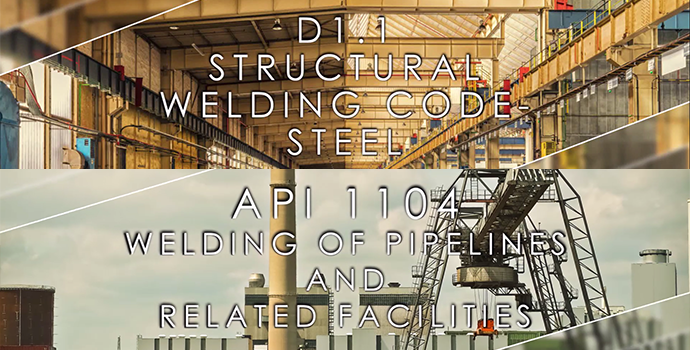 AWS Learning has just released two new online code clinics, covering the AWS D1.1 Structural Welding – Steel and API 1104 Welding of Pipeline and Related Facilities codebooks! Like their live seminar counterparts, these online code clinics are designed to help you tackle Part C of the CWI exam, whether you’re taking it for the first time or looking to bolster your current certification with an endorsement. As you may know, Part C of the CWI exam tests your ability to effectively navigate a code book and identify pertinent information. The online code clinics are built with this in mind, featuring an experienced AWS instructor to guide you every step of the way. In addition, each online code clinic features practice questions with guided answers, interactive quizzes, and a final exam. These all help you put your newfound knowledge and techniques to work, which you can then carry over into the exam or out into the field. The purchase of any online code clinic also includes the Online Code Clinic Pre-Course. The Pre-Course covers code book structure and layout, test-taking strategies, guidance on code book preparation, and other useful information. Together, the content ensures you are equipped with everything you need before you begin the code clinic. It’s important to keep in mind that the online code clinics are not meant to be carbon copies of the code clinics in the live seminar. Sure, in many ways the content covered in these two formats may mirror one another. However, the online code clinics allow you to progress on your terms and on your schedule. This is key. If there is a concept that gives you some trouble the first time around, you can take a break and revisit it when you feel like you’re ready. You can dissect and internalize the content at your own pace instead of all at once, allowing you to move on to new material when you’re comfortable and confident that you’ve got it down. The D1.1 Online Code Clinic has a run time of 4 hours, while the API 1104 Online Code Clinic takes about 3 hours to complete. Both are priced at $300, but can be had for $250 if you’re an AWS member. If you want to know more about the instructors who helped us put this together, you’ll definitely want to check back with us next week. We’ll talk with Dave Diaz and Rick Suria, the instructors for our API 1104 and AWS D1.1 Online Code Clinics. They’ll tell us a bit about themselves, what you can expect when you take the online code clinic, and how you can get the most out of the experience. They will also take some time to address some of the questions they are most frequently asked by students. Maybe we can even coax them to give us a tip or two about exam prep! Until then, if you’d like to learn more about, or purchase, one of our two new code clinics, please visit our Online Code Clinic landing page.